Michael and I are major movie buffs. Sure we go to see live theatre every single chance we get, but living in Macau our choices were limited to the two big shows in town or heading over to Hong Kong every few months to see whatever tour was coming through. Movies on the other hand, were much more available. When we first moved to Macau, there were two movie theaters. 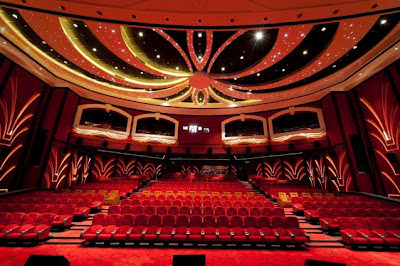 One was the Portuguese Cineteatro Macau. They had four houses, the highest one being on the eighth floor. And no lift, just a tiny set of stairs that could barely fit two people trying to pass. Most of the houses had simple digital projectors that you could buy yourself to project on your living room wall. The seats were highly uncomfortable. The other theater was at the Macau Tower. It has a single house and looks much like a large university lecture hall. The old wooden seats even have trays that fold out of the arm rests. Last December, the Galaxy Macau (one of the large casino complexes) opened a United Artists Cinema which blew the other two out of the water. No competition whatsoever. The UA Galaxy has nine houses, reclining plush seats, thick carpet to muffle sound, and even a few Directors Club houses which seat just a handful of people in enormous, fully reclining Barcaloungers with foot rests. You can press a button and an attendant will bring you refills of popcorn and soda, included in the price of your ticket. Once we went to the Galaxy, we only ever went back to the other theaters one time, to see movies that weren't playing at the UA Galaxy on the day we had available to see them. During Michael's recent garden leave, we had plenty of time to see movies, and we saw everything that came through, even the stinky films we would normally skip. We went so often that the staff remembered us by name and lit up with big smiles when they saw us coming. It helped that we had a full-time, live-out baby sitter/helper which allowed us to have frequent date nights. Now that we're in Shanghai, we don't have help. Yet. So date night is suspended. But because we've been here 2+ weeks, we decided to go see a movie that was kid friendly. Madagascar 3 in 3-D recently came out, my kids have been begging to see it, and was the only thing kid-appropriate that was in English, so that's what we saw (and honestly, I laughed. It was entertaining). However, the experience overall was so far away from the UA Galaxy I wanted to cry! Buying the tickets was crazy. We got in a long line, flanked by men in ball caps, holding stacks of cash in one hand and tickets in the other. They'd approach people in the line and then whisk them away, never to return. Touts? Scalpers? Don't know. We got halfway to the counter and were approached by two ladies in uniforms who had a printout of the film schedule. The printout was completely in Chinese, except for a couple titles, like Men in Black and Madagascar. They asked us which film we wanted to see, and we told them. They said that they had tickets at a good price, 90RMB, and to follow them. 90RMB is about $15 USD, which I thought was a little high (high for Macau, low for Los Angeles, it's all relative). But they took us to a VIP counter, let us pick our seats (which is common everywhere in the world except the USA), and then made change for the 400RMB we forked over. We got popcorn and drinks and then went to the theater entrance, where we were confronted with the bizarre sight of a puppet theater featuring characters from Madagascar talking about a milky beverage that a nice lady nearby had a tray of samples to offer. I'm assuming this is what was going on, because it was all in Chinese, but when we paused to look at the poor puppets with no audience, we were offered drinks. We declined. Up to the theater we went. We climbed a few sets of stairs and ducked into the very low entrance. In Macau and Hong Kong, you have to buy or bring your own 3-D glasses. Here in Shanghai they give you a pair at the door, which they collect at the end. It was quite obvious that they recycle them and don't wash or sanitize them between movies, because all of our glasses were smudgy, and mine was greasy in all the places that it was supposed to touch your head. Out came my wipes and I rubbed and scrubbed and tried not to think negative thoughts about the creepiness (I know my sister-in-law Holly is ready to throw up reading this right about now. I'm trying not to throw up recalling it). We entered the actual theater and went to our assigned seats. The entire theater smelled strongly of urine and mold. Not a pleasant combination at all. Our chairs were suspect, they were all stained and damp and covered in popcorn. My cupholder was completely filled with old popcorn, the floor wet. The armrests were sticky and greasy, and I was not about to put my backpack on the floor, so I kept it on my lap with my arms folded across my chest. When it was all over, I rushed us out of there quickly. We were sent out a back way, which took us right through the kitchen of a seafood restaurant lined with tanks of live fishy friends. We got back to the lobby, avoiding the theater bathrooms which smelled even worse than the theater. The theater is in a nice mall, so I herded everyone to the clean mall bathrooms where I forced everyone to scrub their hands and arms before immediately heading home to strip off our clothes to wash in scalding water. Everyone took extra long showers as well. 25 RMB ($4 USD). 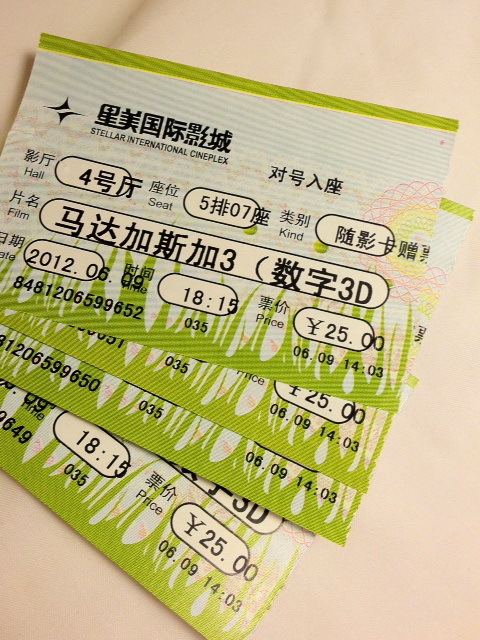 NOT the 90 RMB ($15 USD) that we paid per ticket! Insult to injury, salt in the wound, whatever you want to call it... we'd been had. We paid more because we were dumb foreigners being helped by a kind lady in a uniform who spoke English and said she'd give us the VIP treatment. I think we gave her the VIP treatment with our extra cash! 1. Never, ever return to the Stellar International Cineplex at the Super Brand Mall in Shanghai. 2. Don't be afraid to stand in the line the locals are using and pay the price the locals are paying. This was a fun post to read...really gross and crazy, but fun! ((hugs)) Here's to finding a nice movie theater! !